Naxos is the largest island in the Cyclades, covering an area of 448 square km, placed right in the centre of the Aegean. Its climate is known for its dry, cool summers and its mild winters. The island is diamond-shaped. To the east a mountain range cuts across it. Streams flowing from this mountainous area course across the island in all directions. Among its tallest mountains are Zas (at 1004m - the highest mountain in the Cyclades), Fanari (903 m) and Koronos (992 m). From the peak of Mt Zas one can see the whole of Naxos and all the surrounding Cycladic islands. On the eastern side of the mountain range there are deep gorges and small cultivated valleys, such as that of Apollonas and Lionas. In the centre of Naxos is the plain of Tragea, bursting with all kinds of tress. On the western side there are lush green valleys watered from the springs, such as Melanes, Potamia and Eggares. Livadi is a large and fertile plain stretching from the southern side of Hora down to the south-westerly coast. Naxos’ greatest assets are its long, sandy beaches. The southern shores of the island, from Hora to Moutsouna, abound in beautiful beaches. 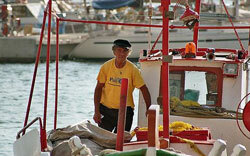 The beaches on the western side, near Hora, are well-known and offer many conveniences. Even the most remote beaches, on the eastern side, are accessible from Moutsouna. Last but not least, on the northern shores of Naxos, there are lots of bays with tiny sheltered beaches. 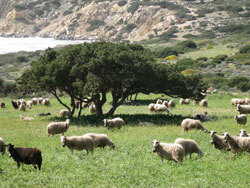 Its fertile soil has enabled Naxos to be self sufficient in terms of agricultural and livestock products. The soil of Naxos also offers two famous and highly-prized natural resources: marble and emery. The white, brilliant marble quarried today in Naxos is essentially the marble which was used to carve the famous Neolithic Cycladic statuettes and the classical kouroi (lifesize statues of young males). It was the material out of which temples and sculptures were made, creations which decorated two of ancient Greece’s most holy places, Delos and Delphi, both dedicated to Apollo. Ancient quarries have been found in different parts of the island. 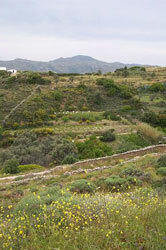 Emery is found mostly on the eastern side of the island, in the areas of Apeiranthos and Koronos. Emery was important when the art of sculpture in Naxos reached its peak, as it was used in the final smoothing of the finished product. In older times the inhabitants of the mountainous areas made their living mainly off the emery. With the discovery of other synthetic materials, however, demand for the natural product dropped. Today, efforts are being made to turn this whole area into a large geological park. There are about 20.000 people living on Naxos today. They main source of income is agriculture and animal farming, but also commerce, marble quarrying and in the last 20 years, tourism. About a quarter of the population lives in Hora most of the locals live in the villages .There are about 40 villages varying in size,whose inhabitants remain unaffected by the busy world of tourism.These people still follow the old ways, still populating the inland parts.These settlements were built there so as to be undetectable from the sea: the people feared the pirates, who terrorized the inhabitants of the Aegean islands for many centuries. For this reason the Naxians made their living from farming and animal husbandry, rather than from the sea. Strange as it may sound, only in the past few years, with the development of tourism, the Naxians started to build settlements on the coast. It is the inhabitants of the villages who have kept the spirit of the island alive, by preserving the bonds with the history, the traditions and the local culture of Naxos, safeguarding their heritage by making it part of their everyday life. There is in Naxos an important, lively musical tradition which is apparent in the inexhaustible flow of talented musicians, dancers and songwriters. The Naxians are open-hearted, warm and welcoming. Their approach to life is both spirited and playful.